Let's assume that the price of apples has risen and that the quantity of apples sold during the last couple of weeks has decreased. From that, we can infer that the supply curve must've shifted to the left. I still have trouble fully understanding this. I was told that when the endogenous variables, such as price and quantity, change, only a movement on the demand/supply curve happens and when exogenous variables change (demand shocks etc.) the curves themselves will shift to the left or right. In this example a price increase takes place, so we're just moving up the demand curve, no? And when we reach the target price level, there'll be a corresponding quantity. And now because of market equilibrium the supply curve has to reach that spot, too? So it shifts to the left? Is that correct? So in a demand - supply model, there can't be singular movements on the curves, as there will always be immediate reactions that seek to recreate the equilibrium? Edit: Thanks for all the answers! Supply and demand curves are a function of price and quantity. If anything else changes other than P or Q that is relevant to the curve, the curve shifts. If you come up with something that didn't fit into these categories, but is not P or Q, the result is still a shift! You probably just need your imagination to squeeze it into one of these 7 formal categories. 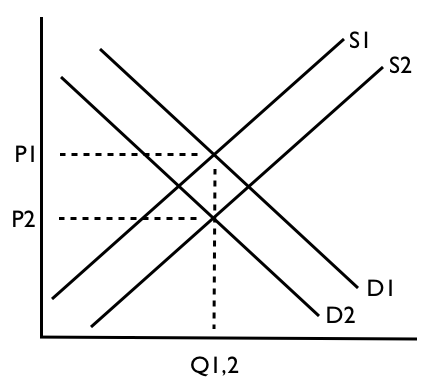 For example, if the supply curve was P=2Q+3, and there was a decrease in the cost of inputs, the demand curve could shift to P=2Q+2. Note how the price levels are lower at every level of Q. Changes in supply and demand that are not "shifts" are called "slides along the curve". They are any direct change in P or Q. This is easiest to see with a linear, mathematical example. Let us say the government wants to set the price of a product. If P=2Q+3 is the supply, then consider that if you set the price (by law) to be 7, then Q is now 2. The curve remains steady, but we slide along it to get to the new P=7, Q=2 position. From wherever P and Q started (P=12 in the example), we now end at point P=7,Q=2, and the curve remains unmoved along the entire line P=2Q+3. Has the price of apples risen because there was an increase in demand? Then the demand curve will shift to the right and you will have a new equilibrium where the new demand curve and the same supply curve intersect. At this higher price, suppliers will be willing to supply a larger amount of apples. Has the price of apples risen because there was a decrease in supply? In that case, supply shifts left, causing the rise in prices where this new supply curve intersects the old demand curve. In other words, the price cannot simply increase by itself. It must be that something in the market has previously shifted to lead to this outcome. can only happen when we're off equilibrium. Whenever we are at an equilibrium, nothing moves, until one of the curves shifts. Now, say one of the curves has shifted. Next, we will move along the curves until we're at an equilibrium again. Hence, any movements along curves can only happen if there was a prior shift in the curves. Typically, we think about these movements happening "quite quickly" in many markets, such that most of the time, these are "almost in equilibrium", just because price responses to changes in shifts of the curves happen so quickly. A = C + D * x.
q = C + D * x – B * p.
To sum up, there are 99.9% cases in the real world are shifts of demand (or supply) curves (the rest is for Economic textbook tests and quizzes). I see why you're confused but I feel like some other comments have addressed this but just incase you're still confused. For an equilibrium to move, one OR both curves need to move. A demand curve cannot move along a demand curve. Any shift of the demand curve will cause a movment along the supply curve. Any shift of the supply curve will cause a movement along the demand curve. You cannot represent a shift in equilibrium movement along a curve with only one curve. You need to have the intersecting curve to show where the equilibrium points lie. Here you see that a fall in the price of a good causes in extension in demand, but you can't tell where the market equillibrium will lie since the S curve hasn't crossed it yet. And finally here are 3 shifts (AD1>AD2, AD2>AD3, AD3>AD4) along a LRAS curve (ignore LRAS1). Here you can see that as AD shifts, the equilibrium point moves along the other (supply) curve. Not the answer you're looking for? Browse other questions tagged microeconomics or ask your own question. 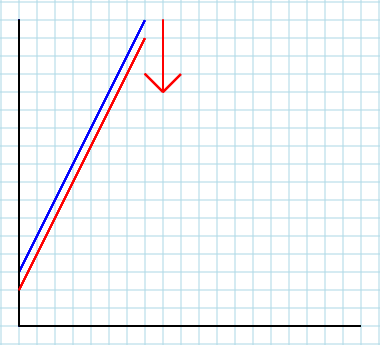 When a relevant variable unnamed on either axis changes, can the curve NOT shift? Why does demand curve shift in, in a monopolistic competitive market? Can the supply curve shift while the PPF does not shift? 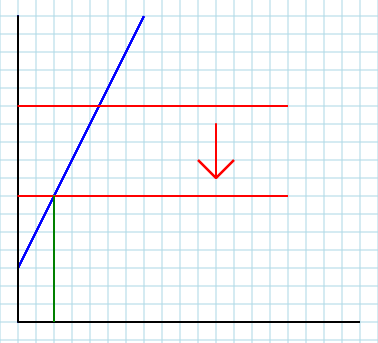 Why slope is constant in demand/supply curve? 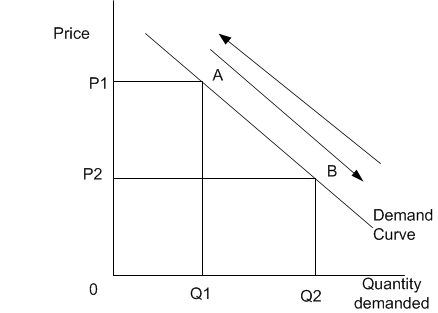 When demand increases why does the price decrease but equilibrium price increase?